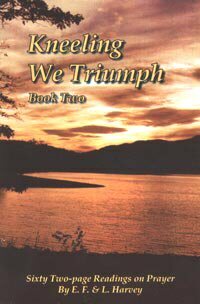 Kneeling We Triumph is a storehouse of precious nuggets on the subject of prayer, compiled from the writings of godly men and women of the past. Consisting of sixty two-page readings, this book will stimulate you to the tremendous possibilities of prayer. Some chapter titles are "Waiting, a Proof of our Faith," "Hush My Heart to Listen," and "When Prayer is a Cry." "Like many other Christian workers who have been anxious to be successful in labor for God, we have been forced to the conclusion that the Holy Spirit alone can effect lasting results. During these past years of heart-searching study, we have gathered together similar conclusions from many God-honored ministers and missionaries who have discovered the secret that the Holy Spirit comes to our aid when, wearied with self-effort, we ask, seek, and knock. We long very much to share with God's children some of these readings and to spread them as widely as possible."